One of my almost daily treats is blueberries. I just admire that juicy sweet yet tart statement of this super-fruit. Doesn’t hurt that they are proven healthy being so high in antioxidants, phytochemicals and even resveratrol – like red grapes. In fact I am seeing more blueberry wine out there in the marketplace. British Columbia grows the high bush variety (as does Michigan) harvested from July to October and they are perfectly fresh early right now because of the hot weather the past weeks. This heat wave can weaken and soften the berries causing more difficulty with shipping so the picking push is on. Low bush (called “wild”) are prominent in Atlantic USA & Canada (Nova Scotia) especially the largest producer the state of Maine. Chile, Australia, New Zealand, Uruguay and other Southern Hemisphere countries are all important producers as well. Though delicious fresh they also can be quickly frozen successfully for use during the off season including winter. 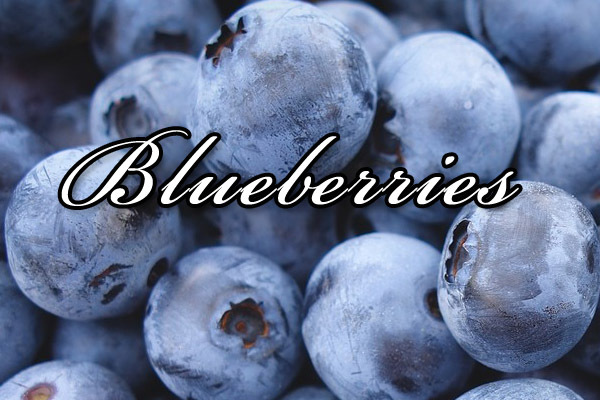 The BC Blueberry Council has an interesting website www.bcblueberry.com for “Nature’s Candy” with useful recipes including smoothies, pancakes, waffles etc. Lots of other blueberry cookbooks out there for you to reference. I enjoy them with breakfast cereal, in my favourite home made bran muffin (not a sweet cupcake), chopped in salsa, and of course blueberry pie. Makes 12. Preheat oven to 400F. Grease muffin tins. In a large bowl whisk together 1/3 cup brown sugar (not packed), 1/4 cup grape seed oil, and 1/4 cup molasses. In a small bowl, whisk together 1 whole egg, 1 egg white then stir in 1 cup skim milk. Add this to sugar mixture. Stir in 1 cup dark raisins (Thompson seedless) and 1 1/2 cups original All-Bran cereal. Let stand 10 minutes. Meanwhile in a small bowl mix together 1/2 cup all-purpose flour, 1/2 cup whole wheat flour, 1 1/2 tsp. baking soda and 3 Tbsp. each of wheat germ and sunflower seeds. Add dry ingredients to wet ingredients and stir only until moistened. Gently stir in 1 cup blueberries, fresh (best) or frozen (not thawed). Spoon into muffin tins and sprinkle tops with sesame seeds. Bake 18 minutes using fresh or frozen berries. If omitting berries, bake muffins 15 minutes. Let stand 5 minutes before turning out onto a rack to cool. Enjoy!